I first interviewed the Common Kings on New Years Eve of 2014. Just like that interview, I had a great time chopping it up with them recently about what they have been up to and what is in store for them. These guys remain to be some of the most humblest, funniest, and most creative musicians I've had the honor of getting to know. Before they shine as musicians and artists, they shine as great friends, sons, husbands, and fathers. Their roots (Hawaii, Samoa, Fiji, Tonga) are represented in full effect and there is no question where their hearts lie. 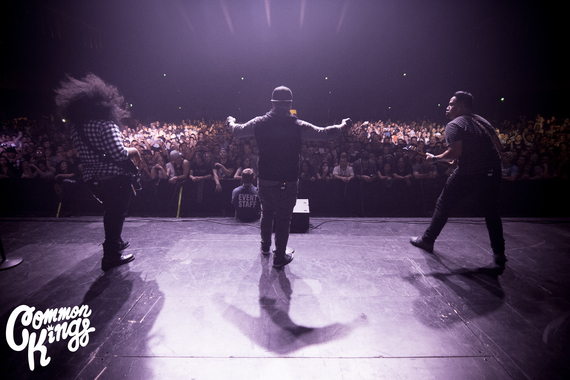 The Common Kings music contains the elements of many genres of music (Rock, R&B, Soul, Hip Hop, Pop, Reggae) that influence and inspire them to be great. The band is masterful at moving people. The content is only part of the recipe. The other part is their ability to remove you from where you are at and placing you with them on their journey. Throw in the fact that their live show seems as seasoned as any band that has been doing it for decades - and you have a force that will keep you grooving and wanting more when the music stops. Thus the strong anticipation for their first album. Well, the wait is nearly over! Before we get into it, check out their website for the "Ain't No Stopping" Tour schedule with Sammy J and Leilani Wolfgramm. The tour kicks off on October 2, 2015, in Las Vegas, NV. Not only is this tour a debut of their newest single, but is also the tour where they release their latest EP to prequel the release of their first album. The long awaited album will definitely be amazing and it couldn't be more deserving for one of the most hardest working bands that I've met. 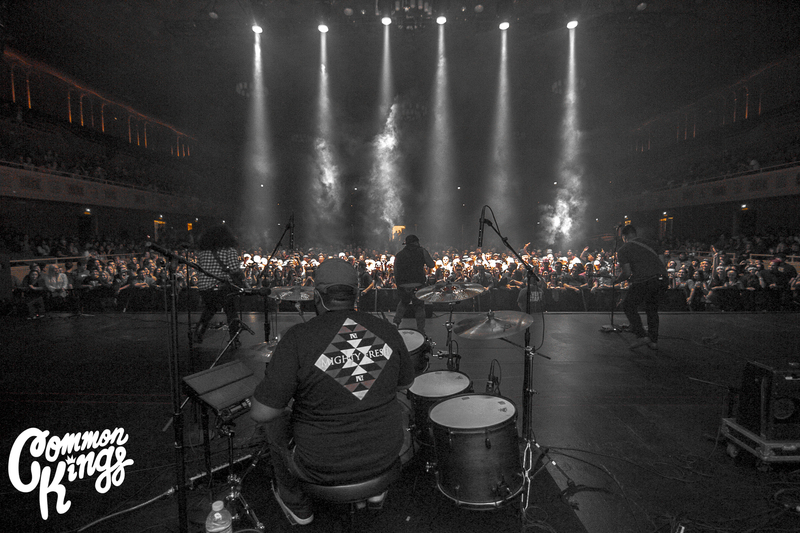 Junior (lead vocals), Mata (guitar), Ivan aka Uncle Lui (bassist) and Rome (drummer) are the Common Kings.If you haven't checked out their music just yet, you don't want to be late in becoming a fan. 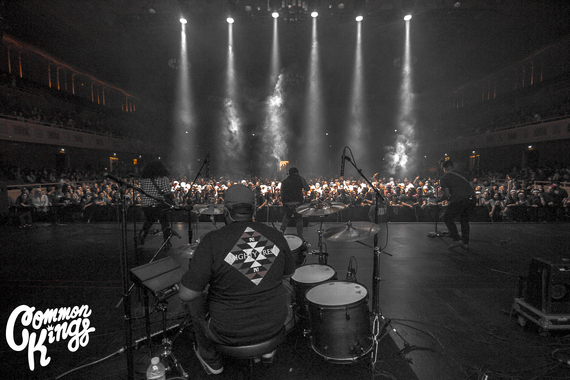 Everyone meet (again) the Common Kings! Since our last interview it seems that the Kings continue to stay real busy. Why don't you guys fill us in on the last 9-10 months. What are some of the highlights since we've last spoke? JR: We've co-headlined in Guam with CeeLo. We mixed and mastered some music - literally last night. We recently finished a tour with Fifth Harmony for about 7 shows. Ivan: Cee Lo is like family. He grew up with Booya Tribe. So we're all somewhat related to them through Mata. As soon as he found that out, he invited us everywhere with him. You guys just finished up touring with Fifth Harmony. How was that experience? JR: It was fun, man. The energy of the fans on that tour, the Fifth Harmony fans, was on a totally different level. It was an experience we've never encountered before. If you think that our fans are crazy, the "Harmonizers" (Fifth Harmony fans) on that tour were a thousand times crazier. Ivan: It was our first experience with real life crazy fan girls and fan boys. It's like when little kids see their idols and they just can't stop screaming. You know, the crowd that we usually play to are definitely more reserved and older or whatever, these kids don't care. If you're just a sound guy walking across the stage, they will scream and cheer their heads off. I mean they treated us like the Polynesian Beatles. So you guys have toured with 2 big acts now: Justin Timberlake and now Fifth Harmony. What were some of the takeaways for you guys from those tours? Ivan: The Fifth Harmony tour was definitely a lot more intimate. With the Justin tour, you knew, "Ok that's the Justin Timberlake camp - this is us." Even though he's cool and everything, he's not going to jump on our set and dance to our songs. However with Fifth Harmony, the first night we performed, they crashed out stage. They are fans of our music and vice versa. They've talked about us since 2013. They Snapchat themselves, singing our songs. So they were real life fans of our music, first. When we performed it was like they were watching one of their favorite bands. They interacted with us and with all that, the crowd would just go crazy. The biggest and main difference between touring with JT and with Fifth Harmony was that Fifth Harmony was way more like a family. They are our sisters and we were all out on the road having fun. Rome: I think one of the things that I took away from the Fifth Harmony tour was just how instantaneous their fan base was and how we had to learn how to communicate with them. For example, they would post pictures on social media like seconds after they would take them. We had to find a way to learn how to really respond and communicate with that. Their fans are just on top of their social media. It so crazy how engaged they are. That's a really cool crossover from island/Polynesian reggae music into more mainstream pop. I love the fact that you represent our culture and push music that all other cultures are going to love. Ivan: As far as the crossover, we use that term because it's the only way to describe our music going from Polynesian reggae that gets the most play in Hawaii to trying to get on the radio out here. In reality though, if you check out all the other poly bands iTunes on their music playlist or whatever, they listen to everything. They just don't listen to island reggae music. So for us, our music is a representation of all of the types of music we listen to on our iPods. We listen to everything. We love all kinds of music that makes us feel good, that makes us cry or laugh, and what we do is continue to maintain the flavor that we can bring. Obviously, if you look at us, your first thought isn't going to be that we are musicians. You're probably thinking that we are bodyguards for somebody. (laughter) Then your second thought is, "Damn, they play some dope music." That's what we've encountered especially on the Fifth Harmony tour. So many kids and parents - especially moms - absolutely love us. Tell us a bit about your newest single "Aint No Stopping." What's the story behind this track? JR: We wrote that song with our good friend, Ethan Thompson. Basically it talks about our struggles and our daily drive. Basically its our way of saying that we are going to keep going, telling ourselves to just don't stop. Ivan: In hindsight, it's kind of a good time to release this song. We have been on a extra grind mode, like super grind mode. I mean for a long time now we've been in the studio from like noon until 3am, like every day we're not performing. Lots of times we've felt like, "Damn, we've been pushing. It feels like we haven't stopped or no end in sight." So this song is representative of where we are at right now like if you were to take a snapshot of us, this would be it. Also this song is the released of our new EP which will lead into our album to be released later. The EP will be released on October 9, 2015, and I can say this with absolute certainty because we just turned it in. This is really big for us on so many levels. The EP has 6 songs. One of the songs is, "Before You Go." We feel that song is a really good song and we just found out that the song has charted high. The people that are helping us now used their machines and algorithms and whatever else they do to see how this song did and it has proven itself. When we released, "Before You Go," we did not do any promotion of it. We just put it up on iTunes, tell our friends in Hawaii, and hoped that people would like it and some would listen to it but it took a life of its own with the help of our fans. Hawaii has been and always been amazing to us as far as our music and we will never downplay that. Because of our fans, "Before You Go" climbed organically on the charts and onto reports that go to big record execs and other people who make big decisions. It's still climbing and all without any promotion or anything from us. So now with the proper push and distribution behind it, we hope that it opens it up to a whole new fan base. Again we owe a lot to our fan base in Hawaii. We've had the luxury of being able to make music and when we finish let them listen and decide what's good and all of this without having to deal with deadlines. Apparently, we have to grow up now and be able to handle those deadlines which we did today. This is a big thing for us and again another reason why, "Ain't No Stopping" is such an anthem and snapshot of us right now. Ya'll are about to start your tour titled after your newest single. Tell us a bit about what to expect from ya'll on this tour. JR: This tour will debut the "Ain't No Stopping" single and of course the EP. We will have Sammy J and Leilani Wolfgramm and we're real excited to be on the road with them. Ivan: Also on this tour, unlike the other tours that we've been on. We actually will have merchandise and products with us. Big things for the Common Kings happening now, as we speak. How are you all feeling now that you're writing the new chapters for the band? JR: I'm real anxious but really excited, bro. We keep pushing and we'll see what's next. Rome: I think it's a huge burden off our shoulders right now. We worked hard up to this point and now we get to take a quick breather, have a sigh of relief. We get to give it to our fans. Ivan: It's a huge sense of accomplishment now. We understand that everything happens for a reason. Now its finally almost time to release our album. We've learned a lot about the industry and being on the road and doing our music. Even since the last time we've talked, we've had so many different things happen to us. There's some ups and there's some downs. Now we have a better focus on who we are as artists, also a focus on our heritage and culture. So the album we've been writing for the last 2 ½ - 3 years, is such an amazing accomplishment for us. The EP will be a good snapshot of what the album is going to look like. How does this parallel into your personal lives? JR: Honestly, it's just like anything else that we are going through. It's a constant grind you know. It takes a full effort just like what we put into our music. In fact it takes just as much more effort if not more in our personal lives. Our families and friends have been our greatest supporters. They've been with us the whole time and without them, I don't think we would be able to be where we are at now. Ivan: There's hope you know. There's light at the end of the tunnel. We've got the right people in place. We've got the right people steering us in the right direction and helping us keep moving in the best way possible. It gives us hope that what we've been doing, the time away from our families, will be for something. Rome: It takes a strong team at home to keep giving us what we need to keep doing what we are doing. They have been super supportive. They help us so that we can keep a clear mind and stay focused on creating music and being creative. It's a huge sacrifice for them and we don't want to let them down. We really owe it to them at home for holding it down, you know what I mean. They hold it down for us physically and spiritually. We have to give it up to all of our families. Our journey has been far and it's going to keep going. They are with us. Our theme really is, "Ain't no stopping now!" Ivan/JR: (laughter) Something about rainbows! Boom. Whoa. Cachow. Shazaam. Bang, bang. What a great way to end an awesome time with you fellas. Go do it fellas. Do what you are supposed to do. BIg thanks fellas!